Disney Hipster Blog: Norways Sweet Almond Pretzel: The OTHER White Bread. Norways Sweet Almond Pretzel: The OTHER White Bread. Before there was School Bread, there were sweet almond pretzels. I'm not implying that one came before the other, as far as their appearance at the Kringla Bakery...I'm speaking of truth. Yes friends, before school bread came into our lives we had another snack preference. Even the sign is a giant pretzel! 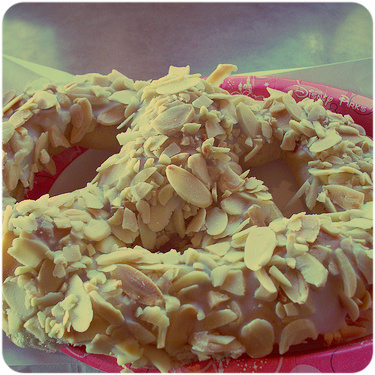 Before we fell head over feet for school bread, we were almost equally obsessed with the sweet almond pretzel. No, its not dripping with vanilla custard...but it does have its merits. The pretzel is a very dense chewy bread, with a similar cardamom flavoring found in school bread, which is to be expected coming from a Norwegian bakery. The interior of the dough is scattered sparingly with raisins, which helps keep the otherwise dry dessert moist. The real magic is on top of the pretzel. A very thick crystalline sugar glaze is slopped on, and topped with crunchy slivered almonds. 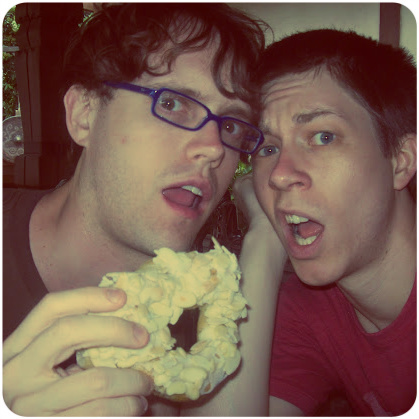 A very OLD picture of us enjoying an almond pretzel. Everything about this snack just works. The bread isn't very sweet, but is balanced with the very sweet icing, while the almonds add both a flavor component and an interesting textural element as well. While the base is somewhat dry and chewy, the raisins help in that department. Next time you're in Epcot's Norway, and you feel like switching up your game, peel yourself out of the effervescent glow of school bread and give this pretzel a shot. Or maybe just get both. I added this to my calendar for next week...thanks for the tip!